This paper explores the idea of writing an eisegesis as part of a creative doctorate. Not that its more commonly named cousin, the exegesis, is not such a bad way to describe, in general terms, what is being written when writing 'the other bit' of a creative writing higher degree dissertation, but it has its limitations. Eisegesis allows for a more subjective exploration of text, for play and uncertainty - 'faulty interpretation' - which in turn can lead the creative researcher to a more expansive way of approaching and writing the companion volume necessary to the fulfillment of a higher degree by research. In this essay I will expand on the idea of writing eisegetically through the prism of my own experience of writing a doctoral dissertation, by harnessing visual images and association and the 'irresistible field' of play. In her very useful census of creative writing doctorates in Australia - those research degrees that combine some sort of major creative writing work with some sort of analysis/critique/examination of that work, commonly known as the exegesis - Nicola Boyd (2009) dates the first creative writing doctorate to 1993, awarded to Graeme Harper from the University of Technology, Sydney. In Australia, it has really only been in the last dozen years or so that this word exegesis has gathered grunt in the creative writing world and has become the word to describe what it is creative writing research students are writing when they theorise about their creative work for a higher degree in the academy; not that this has not attracted intense ongoing debate as expressed numerous times over the years in TEXT. Much has been written about the 'problem' of the exegesis, in particular, the difficulty students have in wrestling with this 'second thing' they have to write, invariably dismissed as second class, even irrelevant. However, in talking of the exegesis as a preface, Nigel Krauth argues that this 'commentary co-text in a non-fiction form' is well established. He takes us back to various examples, suggesting that this form of writing has been around for almost 2000 years (Krauth 2002). He calls it the chance to 'speak twice' where this work is 'a part of the main work, but apart from it'. Indeed, Krauth argues that the promotion of the exegesis as a significant part of the creative doctorate is the key reason, in his view, that this kind of higher degree by research has been allowed into Australian universities. He is probably right. It gives the creative work gravitas, sharpens the field of 'creative research', and secures precious funding. But, as he suggests, it comes with a warning too: 'creative writers write into this maelstrom, this quicksand, this dingo trap' (Krauth 2002). I have to confess, when I first heard the word exegesis sounded out in a creative writing department over a university photocopier (I remember the place, not the time, and I remember laughing out loud, very loud in fact), I could not believe my ears: this word had followed me, and my writing, into the academy. Would it be the trigger to me leaving in a huff, I wondered? Exegesis. Exegetical analysis. Exegeses. The Exegete (that must be pronounced with a capital E). This was too much; it had gone too far. To explain, I have to take you back in time, back to Queensland, to a bastion of fundamentalist thinking. In my family, there were strict rules. In my family, it was a brave person who conducted an exegetical analysis of a passage from the Bible. Exegeses were only for Biblical scholars to exercise; only for the clergy to sweat over who had to compose sermons each week; who had to find some meat to fill 45 minutes of theological air on Sundays. Becoming an Exegete was only for the men of the church who were the ones who ended up in Bible college and who were the ones who came back into the pulpit in robes, with Bibles in their hands and blessings to impart. Not that I did not try - piping up, that is, with my own exegesis. For those who, like me, have been brought up in 'bible-believing' families and who now write fiction (or paint or whatever art form they have chosen), I imagine they too would have a similar reaction; indeed I know they do. I have sat in on many roundtable family conversations examining and arguing the exegesis of the word exegesis in many a sermon. I have listened to arguments over the correct pronunciation - is it ek-si-jee-sis with a strong emphasis on the penultimate syllable or is it ek-si-je-sis, where the last two syllables are swallowed up as one? Theologians and wannabe theologians are practised in pulling apart the fabric of language, words and sentences, until chapter and verse are scraps in the wind, loose threads. They take pride in shredding a text. They pretend they know what they are doing. As a small girl, I thought you actually had to be Jesus himself to do a really good 'exe-Jesus'. I thought you had to look like him at the very least - stand tall in the pulpit, occupy the head of the table, adopt an audacious, arrogant, learned, square-jaw, furrow-brow demeanour, be well-versed in Ancient Greek: dress in men's clothes. I thought you had to 'be called', be ordained by God, glow with supernatural powers of interpretation, make everyone believe you knew the 'will of the Lord'. 'The child looks and recognises before it can speak,' John Berger says. 'Seeing comes before words' (Berger 1972: 7). Exegesis has been part of my daily lexicon since I first lay my head on my mother's lap through the sermon twice every Sunday. From a very young age, the words exegesis and exegetical rolled off my tongue. I recall tripping over the consonants, scrambling the s's into butter, thinking the plural form - exegeses, with its fistful of e's - sounded a bit dangerous, a bit rude, in the same way I can remember the roughness of my mother's strong hand, when in church she stroked my face, how I managed to keep very still, so she would not stop. How I liked the comfort of her palm pressed against my cheek and temple, the way she developed a rhythm across my head and back, and how she sometimes trailed her fingers through the length of my hair. And how the words, intoned from the pulpit in rhythm with her stroking, put me to sleep. Nowadays, in the creative writing world in universities, for students and supervisor alike, you do not have to explain exegesis to anyone, or rather, you feel foolish if you question it. It is the sort of word where, if someone does not know what it means they at least know they should know, so they refrain from asking in case they expose themselves as a fraud. Everyone knows how to spell it too. Some want to adopt the word in order to sound 'appropriately grand'. Still, anxiety persists as to what it really is and, for students, how to produce one as painlessly as possible in order to satisfy academic requirements. 'nosing about' (as someone suggested in conversation). For my Doctor of Creative Arts from the University of Wollongong, the word exegesis did not rate a mention - you cannot find the word on the Wollongong website either, if you do a search. Rather, this 'other half' of the creative doctorate was referred to as a 'set of annotations'. For my particular project, I structured the investigation and writing around visual images and archival documents as a way to explore the relationship between fiction and memoir, the role and place of the body and the imagination in constructing autobiography, the concept of transgression and the 'disobedient subject', and the risks of writing such a work. By turn, I also explored new ways of writing about such an investigation. I was taking a double risk, if you like, not just in daring to write about such subject matter, as it related to my family and to me, but a risk in adopting a particular approach with the writing in terms of style, voice and narrative, as it relates to the academy. The word exegesis only turned up in the final strokes of the process, when composing the opening sentence of the abstract to the second volume of the thesis, the 'Theoretical annotation on the novel'. It reads: 'The theorised annotation/exegesis, A book of pineapple, is a "theorised memoir" about the writing of the novel Bite your tongue.' Interestingly, Jeri Kroll (2004) notes that the University of Wollongong was one of the first universities in Australia to suggest that there should be 'an integral relationship between the creative work and documentation'. When I completed my DCA, I did so with some regret. Regret at having to leave my project, say goodbye. I had enjoyed exploring the world of my story and crafting a 'counter-archive', enjoyed investigating different ways to give voice to its ideas and concerns, playing with form and narrative, finding and settling on (un-settling) the best fit of words and image and 'archive-byte' to match the links and associations I was making, to trace a way of thinking. I relished being surprised, tripping over new connections and 'happy accidents' that I did not know were present, even as I was putting the manuscript through its final edits ready for examination. I loved writing my way into silence (and sometimes confusion) through experimentation and digression, listening out for the grain of the voice, hearing the articulation of the body, and allowing for transformation and transfiguration to occur. How, in the process of writing, prejudices collapsed on reading (as the 'first reader' of my own writing) and how I welcomed submitting myself to ongoing change. I was finding a body way of writing desire and writing shame - in keeping with the themes and tropes developed in the companion works. I was allowing words to transmute on the page into necessary fictions (faux memoir). I was writing in the way Robert Dessaix speaks of it: waiting until what is inside crosses with outside, outside with in (Dessaix 1997: 23). I was making work to make one weep: 'weep for phantoms, because we taste their lives in our mouths' (Clendinnen 2006: 218). I was, it turns out, performing eisegesis as much as, or perhaps more than, exegesis. I wanted to dream my way into the story and for this reason I adopted a 'dream-like' style of writing as a way to fashion these two books. The American writer and creative writing teacher John Gardner believes this is what good fiction does anyway - it creates a dream in the reader's mind. To do this, he argues, the dream needs to be 'vivid and continuous' (Gardner 1991: 31). In the moment of creating my 'dream' I was not so interested in staying true to the evidence or what was recorded about what had happened as fact (that was for another time, perhaps another writer). No, I was more interested in falling into this great mess of a story at different touch points, to shape little nodes of memory and of recall as a catalyst for further work, and invention. This method developed its own 'vivid and continuous' style and pushed me forward, inexorably (vivid here as in striking and spectacular, fresh; continuous meaning without pause). Because it confirmed my desire to write about the private and not the public, in whispers not shouts, about secret things and not things anybody else could find, about the hidden and not the exposed and flaunted. It inspired the particular ilk of these annotations too, a style of writing within these pineapple pages that had grown up 'from the roots' - fresh, without pause (Boulter 2007: 74). It was a model of practice where content and form fit together, hand in glove. In short, I was writing against the grain. Incrementally, memories and connections and threads began to appear on the page that made sense. I could hold it up - hold my mother up, the subject of my research - nudge, cajole, tease. This story became a body for the page - what I call a linguistic body - a body I could recognise, with skin and bones, hair and teeth. And then, in the writing, a peculiar thing happened, as it does if you open yourself to the experience of writing and the written: you realise you believe what you have written down, that it really happened in the way in which you have stitched the dream together. You believe and you grow in faith. It is a parallel version, if you like, a version that might be possible. It offers a way of being different in the world or a way of inhabiting a different world. In any case, a chance for going-forwards. A passage you can trust. It is a method of leaning towards a new future. Even if it might be a 'faulty interpretation' (eisegesis). Even if it is 'the reading into the text things that are foreign to the actual text and context'. By writing a body on the page, a discovered body, an 'improper' body, you reclaim your own. The two words exegesis and eisegesis come from the same etymological root: seek. They are built up from the Greek word hegeisthai meaning 'to guide, to lead' to which is added the two prefixes: either ex meaning 'out of' for exegesis or eis meaning 'into' for eisegesis. The literal meaning of the word exegesis is 'to explain or interpret' a text, but it is also a word connoting 'to guide or lead (someone) out of a complexity' (Partridge 1966). Exegesis is a common enough word you can find in most dictionaries and not un-useful, especially when employed in artful ways. Eisegesis on the other hand is more allusive. Most ordinary dictionaries do not include it, such as the Macquarie (3rd edition). In my friend's Shorter Oxford Vol 1: A-Markworthy it should be squeezed between eirenicon on the topside, meaning a proposal intended to reconcile differences (from the Greek 'to sing'), and eisell on the bottom, an obsolete word meaning vinegar 'with unexplained meaning'. The New shorter Oxford dictionary on historical principles Vol A-M (1993) suggests eisgesis means 'a bringing in' or 'introduce'. In Eric Partridge's Origins: A short etymological dictionary of modern English (1966) it appears as a word meaning an introduction (as of extraneous matter), or 'faulty interpretation'. I like this word 'faulty' or fault (as in the mining term defined by the Macquarie: fractures, with dislocation, a 'break in the continuity of a body of rock or of a vein'). 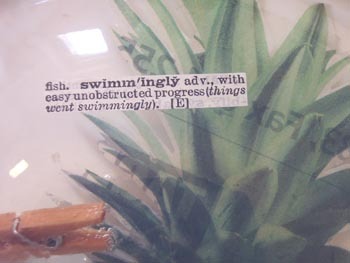 It is a word that opens up possibilities, gives writers permission to fault-er, to 'fool around', to disappear down fissures and think creatively about their work; it embraces failure and mistake, the getting of things wrong; it allows for a yearning for darkness and the state of not knowing; experimentation. It delights in the 'irresistible field of play' (an idea Nigel Krauth (2002) attributes to Vladimir Nabokov). Eisegesis is a way of writing, a way of writing backwards into the text, across the narrative (counter-narrative). Joe Furlonger, a Brisbane painter, suggests: 'The happy accident is probably my motto, I think the only way forward is by making mistakes, and I make plenty' (cited McDonald 2007: 70). Going forwards by going backwards. Or another way of putting it, in keeping with our theological theme: If you sin once, you can sin again. The sweetest of ironies is that the idea of eisegesis is an anathema to theologians (I am talking here about those theologians who base their belief on the absolute truth of the Bible: modern evangelical scholars, fundamentalists, literalists, for example). Eisegesis, they say, is full of 'loose thinking'; it leads to wrong interpretation. It is a dangerous way of approaching texts because it is highly subjective and allows private readings. It might even lead to an 'improper' way of life - God forbid. Creationists call it a 'deadly virus'. 'The eisegesis virus', the organisation Answers in Genesis argues, has been 'responsible for the "deaths" of many church members' and the only 'vaccine' to counter such mayhem is the exegesis (Ham 2002). They are not joking. These kinds of scholars feel safe only in a world of black-and-white thinking, a world without digression, implausibilities, a world with border control. During the writing and researching of my doctorate I was fortunate enough to travel to Switzerland for a residency in a Schloss in Haldenstein. As it happens, I was there on the anniversary of my mother's death - going forwards by going backwards. As the church bells tolled for other deaths around the village that winter, I began to draw in my notebooks, on loose paper, in the snow. Briony Fer talks about drawing and how like breathing it is, in discussing Gabriel Orozco's 'Breathing drawings' (1998-2002). She writes: 'Drawing leads to more drawing. It just goes on, to infinity. Drawing embodies a powerful sense of incompleteness' (Fer 2004: 14). And so my series of drawings came into being: A book of breathing. These drawings in A book of breathing were made with paper, pencil, pastel, water, found rocks, snow, gelatine, cut-up dictionaries and warm air. These 'jelly-books' took on a life of their own, they reflected back a sense of self and purpose, 'introduced' me - eisegetically - to aspects of my project I had not given thought to before, allowed me 'to breath' with the work (in then out and back in again) as it was being fashioned. Created an ineffable space for me to empower my reading of this work. Did what John Carey calls 'imagination stirring', or in literature his idea of 'indistinctness', where the imagination is gripped by whatever it is gripped by and 'cannot leave it alone' (Carey 2005: 213-48). All very prim, very proper. Going to church. Francesca and Angel, mother and daughter. And look, holding hands. What pricks here - Barthes' punctum - is my cocked knee. See how it softens my body, makes my whole body lean and curve towards her. 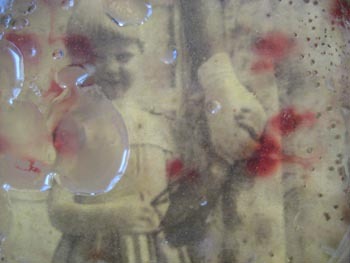 What I enjoyed about this particular 'breathing' experiment - laying the jelly over the found photograph - was the surprise of seeing the jelly across the surface of the image, formed here in a mound when turned out of the jelly mould, so that it looked like the lens of an eye distorting the picture plain. And then how the jelly grew red with time alive with gathering mould and the growth of minute fungi in a furry coating over the surface. 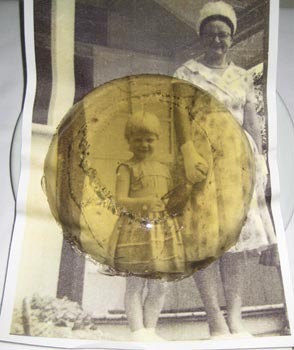 It decayed and disintegrated and slowly turned to liquid and ran off the plate. In my family, we went to church each Sunday. How I loved to trace heat on other people's bodies in the congregation by the sweat marks drawn on their clothes in all the secret places. I would watch patterns take shape in dark patches and lines down the centre of backs and in concentric circles under arms. Sometimes I would see two half moons emerge from under some women's breasts if their dresses were hug-fitting, sometimes wet patches appeared around the crotch of the pale-coloured shorts some men wore tightly, in the 1970s style. How the congregation breathed as one. How very hot days enlivened my attention, my imagination. 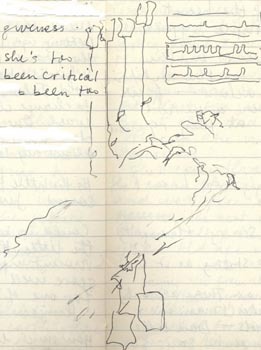 My mother in ICU, a drawing cut out from the pages of a small moleskine notebook, No.50. 'To see someone touching,' New Zealand art critic Justin Paton writes, 'is to imagine doing so; and to imagine doing so is to begin to wonder how it might feel to be that person, to inhabit the situation' (Paton 2001: 11). Paton is commenting here on Anne Noble's photography, particularly those photographs she made of her father after he died. He talks of how photographs help to remind us how 'these worlds are measured by hand'. So what I am suggesting is that this image of a drawing of my mother on the machines in the Prince Charles Hospital Intensive Care Unit in Chermside, Brisbane, shows us her body as a 'world'. 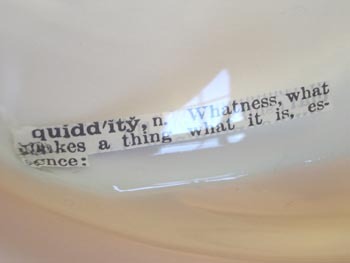 It gives me permission to venture in close, to look, to interpret, to suggest, to 'produce work that is always and peculiarly mine', make a world of knowledge and joy (Webb 2009). Because look again at how my mother hangs here on the page suspended between consciousness and unconsciousness, about to wake up - perhaps. She could already be dead with these lines. 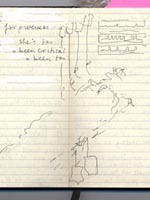 Yet how this drawing takes me back to that moment of not knowing, of being suspended like her between presence and absence, still unaware of the outcome of her heart operation but at least marking the spot with these dangling pencil marks, this 'inbetween writing' (Webb 2009). Giving voice to my voice. This page could be all that is left of her as she leaves this corporeal world: a shaky line, a trace. To the chorus of the drip drip of fluid from the plastic bags attached to her body: four going in from the top, two going out from the bottom. All images and works by the author. Dr Francesca Rendle-Short is a writer and academic. She writes fiction and essays (such as the recent photo essay in Overland entitled 'My father's body'); is the author of the novel Imago and Big Sister (Redress Novellas); and co-wrote, with Felicity Packard, a play for the theatre called Us. She is the Program Director of Creative Writing at RMIT University.